The Dynalock 2011TJ20-LP is a surface mount 2000 series electromagnetic lock for inswing doors with a 12 volt, low power coil. Boasting a 1200 pound holding force and a clear anodized finish, the lock has an adjustable mounting and an upgradable circuit board. The 2000 Series is a full size 1200 lbs. holding force electromagnet. It is designed for life safety and high security on rated or nonrated doors and frames. Specify for commercial, industrial, or institutional openings when low cost and high security are required. All 2000 Series locks are designed for ease of installation with adjustable mounting, field selectable voltage, and convenient wiring compartments. Optional integrated door and lock status sensors allow remote monitoring without the need to install separate "door contacts". The 2000 Series is offered in single, double, and split armature models for both outswinging and inswinging doors. The coil and housing assembly mounts rigidly to the door frame while the armature mounts to the door in a manner that allows it to pivot slightly to compensate for door irregularities. When the door is closed and the lock is energized the armature is magnetically bonded to the lock face, thus securing the door without utilizing any moving parts. 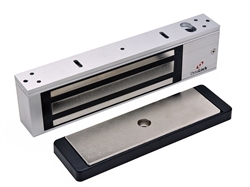 No residual magnetism - the door releases without delay when lock is de-energized.